HOLIDAY GIFTS FOR Alexandria House residents from last year. Climate change, homelessness, mental and physical diseases, and other societal issues pepper our newsfeeds letting us know what is wrong or chaotic in the world. But these issues also can be motivating, inspiring us to reach out to others to try to do good in small ways close to home. Then we can have some feeling of agency, of being able to help make a difference. The following are a sample of local charities that would love your help and donations, not just over the holidays, but throughout the year. If there are any agencies not listed here that you would like to see added, contact us at info@larchmontchronicle.com. Alexandria House, 426 S. Alexandria Ave., has many ways for people to participate, from events like the periodic “tea and tour” functions and the Casino Night and Speakeasy fundraiser at St. Sophia’s Cathedral last month, to food baskets and gift cards given to residents for the holidays. Adopt a family and buy items from their wish list, or donate gift cards from retail stores. If you have an idea for a project, contact Michele Richards at 213-381-2649 or email michele@alexandriahouse.org. Assistance League of Los Angeles, 826 Cole Ave., which runs Operation School Bell and other children’s charities, is having a family day of service Sat., Nov. 17, 10 a.m. to 1 p.m. Families can volunteer to make cards and fleece blankets for youth in foster care. Shop at the holiday estate sale Sat., Dec. 1 (see article on p. 8). Contact Kai Tramiel at ktramiel@assistanceleaguela.org or call 323-469-1973. Big Sunday, 6111 Melrose Ave., has a steady calendar of events throughout the year, and also compiles a list specifically for holiday volunteer opportunities posted at the beginning of November. Help pack bags full of Thanksgiving dinners Wed., Nov. 21, 9 a.m. to noon. Partake in a sing-along with seniors for Hanukkah on Tues., Dec. 4, 6:30 to 7:30 p.m. Have more holiday fun Sun., Dec. 9 from 3 to 5 p.m. at the annual holiday party and sing-along. Call 323-549-9944 or visit bigsunday.org. Cathedral of Our Lady of the Angels Adopt-a-Family Program, 555 W. Temple St., works with charities, the police department and other groups to identify up to 500 needy families to be adopted. They also need volunteers to help with packing and delivering gifts. Anyone who wants to help with deliveries should have a larger car, truck or SUV to accommodate gifts and be at the church Sat., Dec. 15 at 7 a.m. Call 213-637-7501 or email adoptafamily@olacathedral.org. Covenant House of California’s Executive Sleep Out is Thurs., Nov 15, 7 p.m. to 7 a.m, where executives pledge to live outside for 12 hours overnight to raise money for the youth homeless shelter at 1325 N. Western Ave. Or contribute gift cards and basics such as towels and blankets. Call 323-461-3131 or visit covenanthousecalifornia.org. Downtown Women’s Center (DWC) helps homeless women find housing and employment and needs volunteers for packing and sorting donations. There also are wish lists at downtownwomenscenter.org/our-wishlist, or donate retail or grocery store gift cards. Shop the Made by DWC gift store (madebydwc.org), for items crafted from upcycled and donated materials by women at the center. Call 213-680-0600 or visit downtownwomenscenter.org. Call 213-977-2358 or visit goodsam.org for information. Good Shepherd Center for Homeless Women and Children, 1650 Rockwood St., has an Adopt-a-Family / Resident program to provide clothing, toys and gifts for Christmas. There are wish lists for (gschomeless.org/donate-an-item), or donate gift cards. Contact Adriana Sandoval at asandoval@gschomeless.org. Heart of Los Angeles (HOLA), 2701 Wilshire Blvd., Ste. 100, has a wish list for toys, holiday gifts and student care packages. Drop off gift cards to food and retail places and unwrapped gifts for children ages six to 19 at HOLA or having them shipped directly from Amazon. Visit heartofla.org/events or email Stephanie Silberman at ssilberman@heartofla.org. Hollygrove, 815 N. El Centro Ave., a division of Uplift Family Services, always accepts donations of food care packages or cash donations, or check the website for a wish list of items accepted year round. 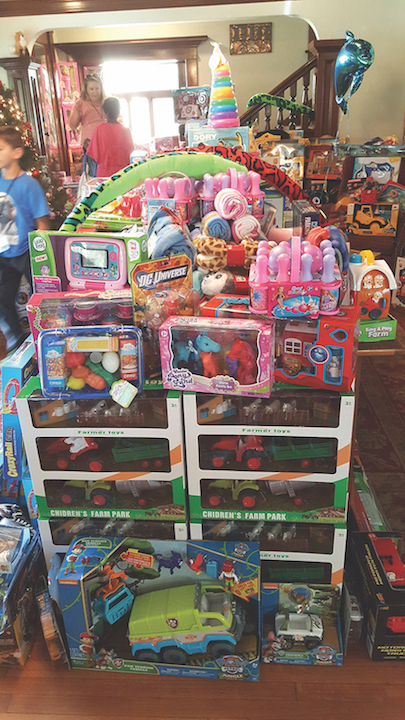 The toy drive begins Mon., Nov. 26. Wanted are unwrapped gifts for children ages infant to 15, gift cards, wrapping paper, tissue, ribbon and tags. Parents then visit Hollygrove’s “Santa’s Workshop” to select and wrap gifts to give their children. The deadline for Christmas donations is Fri., Dec. 8. The holiday fundraiser movie night, Sat., Dec. 1 (see p. 8). Call Kathleen Felesina, 323-769-7142 or email kathleen.felesina@upliftfs.org. Los Angeles Mission, 303 E. 5th St., needs help serving meals all year. Volunteer orientations are the first Saturday of each month or Nov. 3 and Dec. 1 to help for the holidays. Help is also needed wrapping gifts and decorating for the holidays. Donations are always accepted, of course. Call 213-629-1227 or visit losangelesmission.org. National Council of Jewish Women, 543 N. Fairfax Ave., needs volunteers for their annual giveaway to help distribute clothing items and children’s books Sun., Dec. 2 from 6:30 to 2 p.m.
Help is also needed to sort clothes the day before the event Sat., Dec. 1, 8 a.m. to noon. All kinds of clothing and items are accepted for donation at 360 N. Fairfax Ave. between 10:00 a.m. and 5:30p.m. daily; there are also seven other locations throughout Los Angeles. Call 323-852-8515 or email volunteer@ncjwla.org. Olympic Police Division’s Operation Shoes from Santa is asking for shoe donations for school-age children by Sat., Dec. 1 for a winter wonderland event Olympic Division, 1130 S. Vermont Ave., Sat., Dec. 8. There will be a Santa’s workshop, hot chocolate and treats and other activities, plus a visit from Santa. Donate new shoes at the Olympic Area Watch Commanders’ office. Call Eric Mollinedo at 213-793-0785 or email him at 31754@lapd.online. Project Angel Food, 922 Vine St., delivers meals all over Los Angeles to people with critical illness. Every five dollars donated pays for one meal. The organization also needs volunteers to help start putting together Thanksgiving meals and help the pastry chef with the pies and cookies that are distributed to clients and sold to raise money (see article on p. ….). Project Angel Food also needs volunteers to help deliver meals Mon., Dec. 24, Tues., Dec. 25 and Tues., Jan. 1. Volunteer are also urgently needed throughout the month of January. Visit angelfood.org/volunteer, call 323-845-1800 or email volunteers@angelfood.org. St. Brendan Church, 310 S. Van Ness Ave., will have a food drive for Thanksgiving that runs through Thanksgiving Day, Thurs., Nov. 22. Nonperishable food items are collected and then caravanned over to Hope Net’s food pantry. Gift cards and new unwrapped toys for children ages infant to 15 will be accepted for their toy drive through Mon., Dec. 10 for delivery to needy families at Alexandria House, St. Anne’s, Good Shepherd and the Cathedral of Our Lady of the Angels. Last-minute deadline is Fri., Dec. 14. There will also be a holiday craft fair Fri., Nov. 30 to help fundraise, if you want to shop with a purpose. St. Vincent Meals on Wheels, 2303 Miramar St., delivers hot meals to anyone in need and within the delivery area. Currently, the charity needs drivers and runners for Thanksgiving, Christmas and New Year‘s Day. Another way to help is to take part in their fundraising gala at Petrossian in West Hollywood, 321 S. Robertson Blvd., Sun., Dec. 9. The “Caviar Salon” begins at 5:30 p.m., and cocktails and caviar are served from 7 to 9 p.m. Call Daryl Twerdahl, 213-484-7476, or visit stvincentmow.org. Wilshire Boulevard Temple’s Big Give at the Karsh Center, 3750 W. 6th St., hands out Thanksgiving dinners to families in need Sun., Nov. 18. Volunteers are needed to help pack up and pass out the food. There also are activities for kids, or you may donate to help pay for the dinner. Contact Don Levy at dlevy@wbtla.org or visit wbtla.org/volunteer.